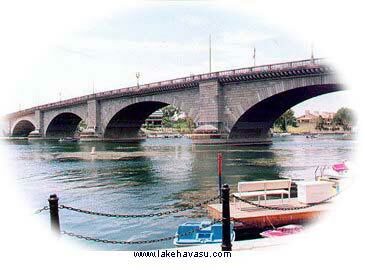 Lake Havasu City, the famed home of the London Bridge, was named for it's 45 mile long lake on the Colorado River, named by the Chemehuevi meaning "Land of the Blue Green Water". The Lake is actually a Colorado River reservoir that was created when the Parker Dam was built between 1934-1938. The London Bridge, which crosses the Bridgewater Channel from the mainland to a small island on the Colorado River, is world-famous and draws visitors from all over the world. When the bridge was sinking into the River Thames in London, Robert P. McCulloch saw an opportunity. Having the winning bid, the bridge was dismantled and sent by barge to the California coast where it was loaded, trucked to Lake Havasu and rebuilt "brick" by "brick". The bridge is a focal point for the city. The lure of merry old England draws our year-round guests. Nestled beneath the bridge is our "English Village" which offers a British flavor for your shopping and dining pleasure. With its Tudor style architecture, the shops and restaurants do create the atmosphere of seeing a piece of "merry olde England". Stroll the tree-lined walkways, shop and stop at one of our local breweries for a hand-crafted beer (root beer too!). The various restaurants offer a variety to please any palate. Here you can also rent a paddle boat, take a boat tour or take the ferry to the California side of the Lake. Our 26 square mile city has a population of about 45,000. Because of our affordable housing, many winter and summer visitors alike own second homes here and truly can call Lake Havasu City "home". Some of our winter guests and residents stay as long as 6 months in Lake Havasu! However you like your recreation or lifestyle, chances are you'll find it in Lake Havasu City.